I took my 13 year old and her friend to see Eclipse. I honestly was looking forward to it. I enjoyed the books. The movies so far have been good of course the book is always better in any book to movie adaption. I have to say Eclipse was the best of the movies so far. 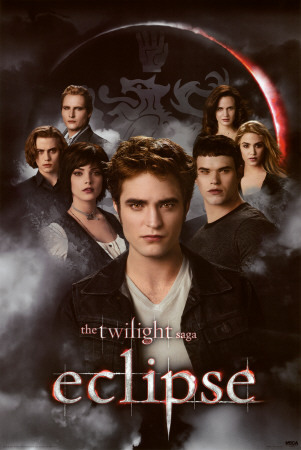 It had more romance and action than the other 2 and it also showed more of the Cullens especially Jasper and Rosalie. I found Jasper's role in the movie to be awesome I wish there was even more. I don't want to spoil it for anyone, but they show flashbacks of Jasper as well as Rosalie and they were fabulous. My daughter, her friend and I are now officially Team Jasper. Forget about Edward and Jacob. Jasper is just adorable especially with Alice. My daughter has also had it with Bella. She doesn't understand why everyone is so into her. My daughter thinks she's boring. She still loves Edward, but Jasper has won her over. We can only hope that Stephanie Myers writes more especially about Jasper and Alice. I think that would be a much more interesting story. I really enjoyed the movie though my daughter was a little annoyed with the Bella, Edward and Jacob love triangle. She thought it was stupid. I do have to say I wish it ended here because I have no idea how they're going to bring Breaking Dawn to the screen and honestly I'm not sure I want to see it. It was definitely my least favorite book of the series. I thought it had way too much Jacob and at that point in the story I thought we were done with him, but no he's just like an itch you can't scratch. I guess I'll find out though because I have to see how it all ends in the movies that is. I hope everyone had a great forth of July. We had a great day. We went to the Red Sox game. It was a challenge driving into Boston as many of the roads were closed. My husband did it with little help from the navigation device. If the stupid thing said it was recalculating one more time I was going to loose it. We made it in and ate at Boston Beer Works. We had to wait like 45 minutes, but we ate quick and headed into the part. It was pretty awesome. They drop the big flag over the Green Monster and there was a fly over. The kids loved it. I had them dressed in their Red Sox shirts and some festive ribbons in their hair. They were so happy to be there the only problem was it was really hot. When we got to our seats we were happy to find that we were in the shade at least for a little while. That sun line kept creeping its way toward us. It finally hit us half way through the game. We were prepared with our hats and sunblock so no big deal. We got the girls and ourselves drinks and the little one got a frozen lemonade. Oh and we had some popcorn. We sang all Sweet Caroline and Take Me Out to the Ballgame. The girls loved it. Then a really entertaining thing happened. It was right before the 9th inning and they were playing Mylie Cyrus's song Party in the USA. Well my little one was getting a little board so I started singing and dancing with her in our seats. Someone spotted us and we ended up on the big screen. My daughter was so excited and I was a little embarrassed. It was the best part of her day. All in all it was a great day the only bad part was the Sox lost. It was disappointing, but we were happy to be there. We got some ice cream on the way home and then collapsed when we got there. It was a long, fun day that the girls and I will always remember. 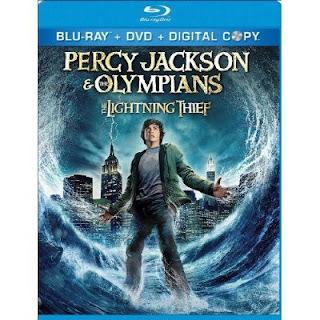 This week is a week my girls have been looking forward to since they first saw Percy Jackson & The Olympians: The Lightening Thief in the theaters. This is the week it came out on video. They loved the movie and to be honest so did I. After my 9 year old saw it she wanted to read the book right away. I think any movie that encourages reading is a good thing. I have been meaning to read the books as well. Anyway the movie came out on DVD and Blu-ray this week. I picked it up on Blu-ray on Tuesday. My daughter went to watch it with her cousin on Tuesday and they had a great time. Now since we got the movie they have both watched it about 4 times. They love it. When I finally had time to watch it last night they sat down with me and watched it again. Truly a great movie that I hope will be the first of many Percy Jackson movies. It is just such a fun movie that if you didn't get a chance to see in the theaters I highly recommend you give it a try now. You won't be disappointed. My girls particularly my 9 year old is in love with this new show, Unnatural History . If you don't regularly watch The Cartoon Network then you probably wouldn't know what this show is and let me tell you it is very entertaining. In fact it's a show that my whole family has sat down and watched together the past 2 weeks and we are looking forward to this weeks episode or adventure. The show centers around a teen boy named Henry who has grown up all around the world and learning exceptional skills along the way. His parents think it's time for him to go home. They send him to live with his uncle and his cousin Jasper. He will attend a school that is part of a museum. There he works in a room where there are all kinds of historical artifacts that need to be logged and he finds all kinds of things. Adventures are abound and what I really love is they mix in real historical information in the show. So while watching the show my kids are being entertained by the action and there is quite a bit and they also learn about some interesting things from history. I love history as does my husband and my oldest daughter now my youngest is getting interested. I say bravo to The Cartoon Network for airing a show like this. My girls don't usually watch The Cartoon Network. Well except for Total Drama Island/Action/World Tour, but now they will be tuning in every Sunday night at 8:00pm. If you haven't checked the show out you should it really is a fun show.